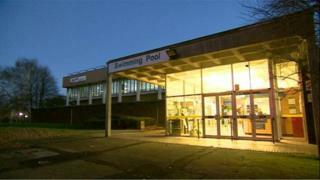 The fate of a threatened Derby swimming pool will be debated after a petition passed a benchmark figure. The Labour-controlled city council wants to shut Moorways from April in a bid to save £79m in three years. Rival political groups have backed the petition, calling for it to remain open, which has now gathered more than the 5,000 signatures required. The issue will be raised at the next council meeting on 28 January, officials have confirmed. In three weeks campaigners have collected 4,000 signatures on an online petition with a further 1,000 on paper. Lifeguard Mark Stewart said they accepted the 33m pool was in need of repair but closing it while another is built, was not the answer. He said the debate was the last chance to change the minds of council officers. "We are optimistic," he said. "There could be a change of heart. There are a lot of good arguments for keeping it and people do like it. "It is still an open debate and anything could happen now." The city council said it would build a new 50m pool by 2018 to replace the facility on the same site. A spokeswoman for Derby City Council said leader Ranjit Banwait had already agreed to allow campaigners to put their case to the council. Swimming club Derventio Excel - which coached Commonwealth Games medallist Molly Renshaw - said the decision had left it no viable alternative site for training. Commonwealth Games medallist Adam Peaty, who trains in Derby, said closing Moorways was a "waste".